SMALL GRACES IS A COSY NEIGHBOURHOOD CAFE AND RESTAURANT IN FOOTSCRAY, WHERE WE SERVE CREATIVE, SEASONAL, DELICIOUS FOOD FOR BREAKFAST, LUNCH AND DINNER. We have a strong focus on provenance and sustainability in our food, minimising waste and sourcing from local, ethical suppliers wherever possible. We also make almost everything from scratch, in-house. The cafe is open for breakfast and lunch every day of the week, as well as Thursday, Friday and Saturday nights for dinner & drinks. We also offer corporate or private catering and can host small functions and special events. 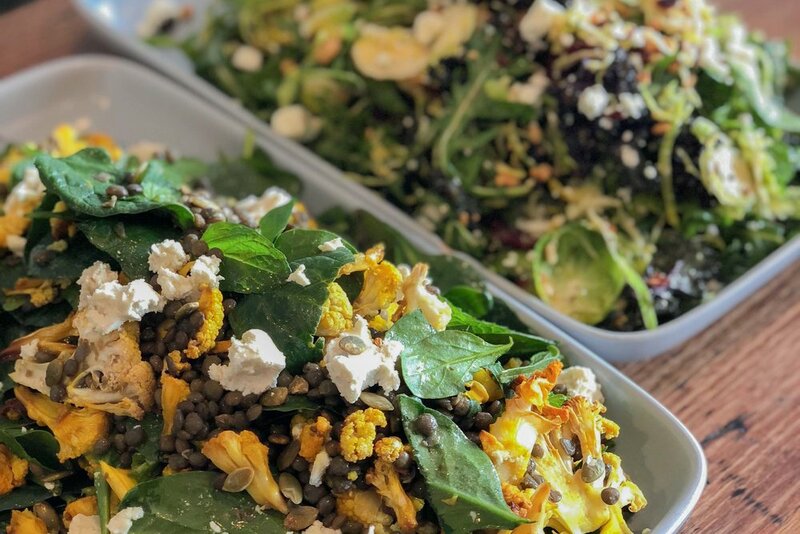 Our day menu includes a range of seasonal, creative breakfast and lunch dishes, made from high quality, sustainable produce with lots of vegan and gluten friendly options. Although the focus is still on seasonal, simple food, our dinner menu is a bit more fancy. Think beautiful sharing plates and a lovely selection of locally sourced wines, beers and spirits. We provide delicious, convenient catering for all kinds of events, ranging from corporate workshops to intimate family dinners, cocktail parties and weddings. Go on — make it easy on yourself! The idea behind Small Graces is being good to yourself: taking daily pleasure from eating good food, to nourish your body and mind. Breakfast and lunch is casual, wholesome and delicious, with heaps of vegan and gluten friendly options. We use real foods like seasonal fruit and veg, legumes, ferments, whole-milk dairy, and some less popular cuts of meat (that just need a little love). We also use very little sugar -- so you'll find that our sweet options are actually still pretty good for you. Coffee is from the lads at Rumble Coffee in Kensington, and we use Dench Bakers Artisan Sourdough bread. Dinner is a touch more refined, but still focuses on making the absolute best of seasonal produce, complemented by a few high-quality, ethically raised meats (which are more of an accompaniment to the vegetables than the other way around). Find out more about us, or read our latest news. Also check out what Good Food, Time Out, Broadsheet and The Urban List have to say!